The New Respects are all about breaking down cultural expectations. They’re a family band, comprised of twin sisters Lexi and Zandy Fitzgerald, their older brother Darius and their cousin Jasmine Mullen. 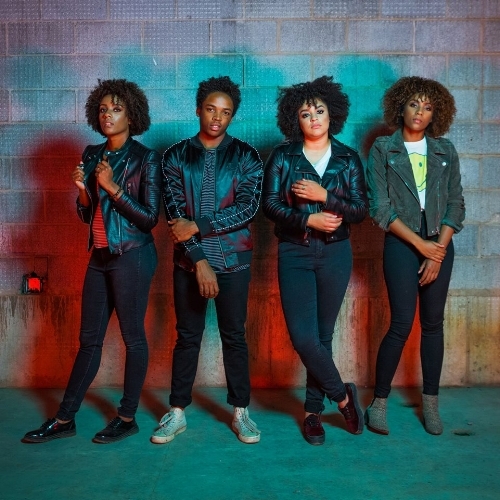 Gospel, Motown, and Christian music comprise the musical roots of the band but don’t think that you’re getting R&B set from The New Respects when they take the stage at this year’s Ride Festival. They are very much aware of the dichotomy of their image and their sound and are proud to be breaking down expectations of a black artist’s place in the music scene. The Fitzgeralds and Mullen are from Nashville, TN and naturally draw inspiration from the famed music city. Zandy, Lexi and Darius are the pastor’s children. Home-schooled by their mother, gospel greats including Fred Hammond and Kirk Franklin were mixed in with Jackson 5 and Veggie Tales. Mullen’s parents are both songwriters and her mother, Nicole C. Mullen, is a successful contemporary Christian and gospel singer. Mullen wrote her first song at age 3 but it wasn’t until high school that Zandy spearheaded the formation of the band, under the moniker The John Hancock Band. Self-described as “Mumford and Sisters,” the group’s acoustic folk sound began to evolve to its current state as the members found classics like Aretha Franklin, the Rolling Stones and the Beatles. Rock & Roll became more enticing and with the discovery of Big Mama Thornton and Sister Rosetta Tharpe, Zandy, Lexi and Jasmine began to find musicians that resembled them. In March of 2017, The New Respects were among the 10 New Artists You Need to Know in Rolling Stone and most recently opened for Robert Randolph and the Family Band. On July 25th they will grace the stage of the Ryman Auditorium. Expect the unexpected when the New Respects take the main stage 11:00 to 11:50 A.M. Sunday, July 14th in Town Park.